Behgjet Pachouli is the Foreign Minister of the Republic of Kosovo. Citizens of Macedonia, Serbia, Montenegro, Bosnia and Albania, can all travel in Europe visa free. My country, Kosovo, remains the only European democracy whose nationals are deprived of this right. We are still faced with the shameful situation of having to apply for a visa (a costly and time-consuming process) just in order to take holidays or visit relatives. The benefits of a liberalised visa regime are considerable – boosting economic partnerships, promoting cross-cultural contact, improving professional and educational exchange, and even helping to stifle the role of people smugglers, whose services would no longer be required. Crucially, the principles behind visa liberalisation are those which the European Union states it most values – openness, justice and unity. We have already been patient, looking on as the citizens of all countries which neighbour Kosovo have gained the right to travel freely to the Schengen area for a period of up to 90 days. Given that 84% of Kosovars think that EU membership is a good thing for their country, the EU cannot afford to alienate our enthusiastic population. There are enough crises in Europe to risk creating a new one. Just recently I visited Berlin and many other EU capitals to lobby for granting visa free travel Kosovo’s citizens and make the case for the benefits of such a decision. It was encouraging that my colleague Michael Roth, the German Minister for Europe strongly supported us. Kosovo’s relations with the EU are strategic for us, just as the Balkans are a strategic region for the EU. This is an opportunity for the EU to show global leadership by delivering in its immediate front-yard. Kosovo and the Balkans are a test for the EU’s credibility and its international standing. So I am calling on European leaders to validate the positive recommendations made by the European Commission on 18 July last year, and since passed by the EU Parliament, confirming that all the outstanding requirements had been met. All that remains is for the European Council to approve the Commission’s proposal, to end the unfair treatment we have been subjected to. We hear that certain member states have concerns about irregular migration, and that the negative votes of MEPs from France, the Netherlands and Cyprus are representative of opinions held by their populations. 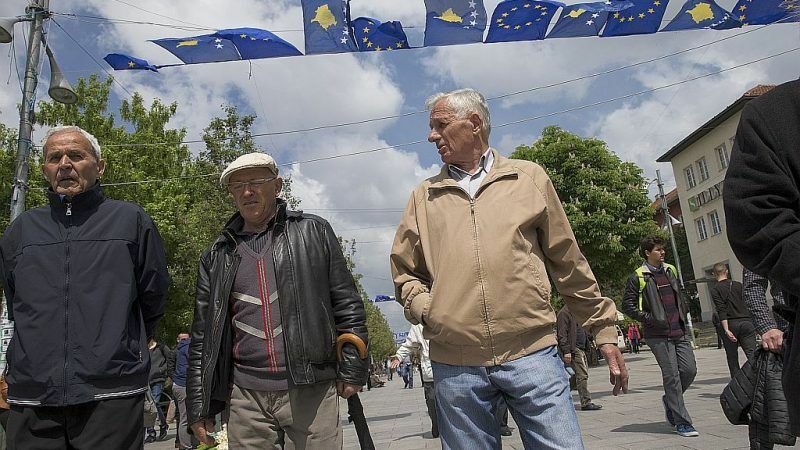 However, as the positive votes in the Commission and Parliament demonstrate, Kosovo has put into place the necessary frameworks to deal with this issue, and many others. Without a doubt, at each of these stages, the requirements have been met. This process, which began in 2012, has been taken seriously by all partners. We achieved the 95 benchmarks which relate to migration, border management and security and fundamental rights. Most recently, the Commission noted our strong “track record in the fight against organised crime and corruption”. We now need to get over the final hurdle. I am confident that we will be heard, since the EU knows that visa liberalisation by the European Council would benefit all of us. In particular the young people of Kosovo, who make up 60% of the population. For these Kosovars, a European future is the only one they can envisage, and the only one they desire. Delaying the decision further is not in the EU’s interest as it would severely damage the reliability of its promises. We appreciate that with the upcoming European elections and a change at the helm of the Commission, as well as numerous parliamentary elections across member states, visa liberalisation for Kosovo is not top of the agenda. However, this is not a good enough excuse – EU member states must take into account the aspirations of those countries on the outside, looking in, and seize this opportunity to maintain optimism about what the EU can offer. Member states must not let a fear of populist sentiment control their decisions when legitimate progress has been made by deserving Europeans. Moreover, irregular migration is a concern for all of us – on which we can work together – and unrelated to the law-abiding citizens wishing to expand their horizons across the continent of which they see themselves to be a part. Many MEPs have voiced their support for visa liberalisation, and urged the Council to take active steps to approve its finalisation. This backing is greatly appreciated, but in order to achieve the established threshold, we need national politicians themselves to build on the calls, and acknowledge that we’ve worked tirelessly to fulfill all the necessary criteria. Now it is time to do the right and fair thing by rewarding these efforts. Once a promise is made, it must be honoured.